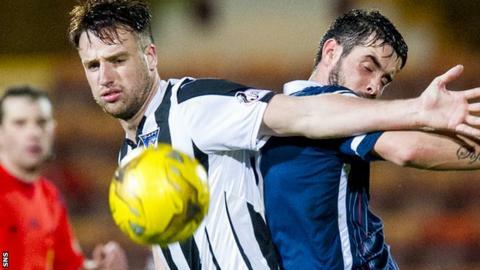 Dunfermline Athletic's rivals must have watched with envy as the Scottish League One rivals strengthened their ranks with two defenders with top-flight experience. The full-time club added Brad McKay, on loan from St Johnstone, and Craig Reid, released by Motherwell. At least second-top Ayr United managed to hold on to influential midfielder Ryan Stevenson, who was allowed to leave Partick Thistle after a spell on loan at Somerset Park. Fourth-top Airdrieonians, under new head coach Eddie Wolecki Black, and relegation-troubled Cowdenbeath have experienced the busiest turnover during January. Wolecki Black, looking to repeat his success with the Glasgow City women's team, has reshaped the squad inherited from Forfar Athletic-bound Gary Bollan, with former Livingston midfielders Jacob Esposito and Hugo Faria notable arrivals. They will be chased for a promotion spot by a Stranraer side bolstered by the return of wing talisman Willie Gibson from Dumbarton. Stenhousemuir's promotion hopes will not have been helped by midfielder Harry Monaghan accepting a full-time move to Derry City and striker Jon McShane's exit to Australian club Hume City. In: Jacob Esposito, midfielder (Maccabi Hakoah); Hugo Faria, midfielder (Livingston); Kieran MacDonald, defender (East Fife). Loan: Dylan Mackin, forward (Motherwell); David Ferguson, defender (Motherwell). In: Loan: Spas Georgiev, midfielder (Livingston); Darren Petrie, midfielder (Raith Rovers). Out: Josh Mullin, midfielder (Livingston, undisclosed); John Gemmell, forward (Clyde). In: Ryan Stevenson, midfielder (Partick Thistle). Out: Ross Caldwell, forward (Cowdenbeath); Paul Slane, midfielder (Clyde); Martyn Campbell, defender. In: Loan: Scott Shepherd, forward (Falkirk); Lewis Spence, midfielder (Dunfermline Athletic). Out: Dene Shields, forward. Loan ended: Isaac Layne, forward (Alloa Athletic). Out: Luke Armstrong, forward. Loan ended: Andy Murdoch, midfielder (Rangers). In: Craig Reid, defender (Motherwell); Evan Horne, midfielder (Dundee United). Loan: Brad McKay, defender (St Johnstone). Out: Chris Templeman, forward (Montrose); Kevin Nicholl, defender (Annan Athletic). Out: Loan: Scott Ferries, midfielder (East Stirlingshire); Scott Adams, midfielder (Buckie Thistle); Ryan Baptie, defender (Linlithgow Rose). In: Loan: Colin McCabe, goalkeeper (Celtic); Graham Bowman, goalkeeper (Falkirk). Out: Harry Monaghan, midfielder (Derry City); Jon McShane, forward (Hume City). Loan ended: Matthew Gould, goalkeeper (Livingston). In: Willie Gibson, midfielder (Dumbarton); Loan: Cameron Belford, goalkeeper (Wrexham). Out: Luciano Nequecaur, forward; Jamie McCluskey, midfielder; Liam Rowan, defender. Loan: Peter McGill, midfielder (Troon).